My objective as an artist is to create work that decreases the negative perception of young people in today’s society. I use different aspects of pop culture to create pieces that counteract this social injustice. My art has allowed me to inspire and to make a difference in many lives. As a native of Baltimore, Maryland, I’ve notice that there are many young people who are making a difference but are not being recognized. Helping the community is a great passion of mine and being able to use the skills I have acquired over the years to make a statement is epic. Part of my mission as an artist is to decrease the negative perception that adults have on youth in today’s society. In my work, I like to illustrate urban concepts both digitally and through the use of traditional media. This makes my work accessible to its intended audience; my peers, the community and young people. I am asked daily, why I have a passion for art. I simply tell them my biggest inspiration. Growing up as woman without a father figure has definitely been hard and I can truly relate to what a lot of young people go through today. Not only does it hurt you inside, it leaves a permanent scar and gives you the feeling of being unwanted. I believe women are the backbone of each other. Especially if you are a single parent, my mother and grandmother always encouraged me to follow my dreams, and to never use the excuse of not having a father present. Not having a father present gave me the inspiration and motivation to do my art. It also allowed me to encourage others in the process. My upcoming brand “MY ADDICTION WHAT’S YOURS?” features a series called “THE RUNWAY IS MY CANVAS” which speaks to the idea of “Life as Canvas.” My favorite “life canvas” is a sneaker. Sneakers are a huge component of urban culture and a symbol of self-identity. Walking every day in my shoes gives me the confidence and drive to continue doing what I love and do best. Everyone has their own canvas in life whether it is a hobby, an obstacle, or a craft. 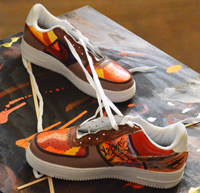 On my sneaker canvas, I use my imagination and illustrate what I see in life every day. My identity as an artist does not only involve the ability to express oneself, but the ability to empower others to use their imagination and creative voices.